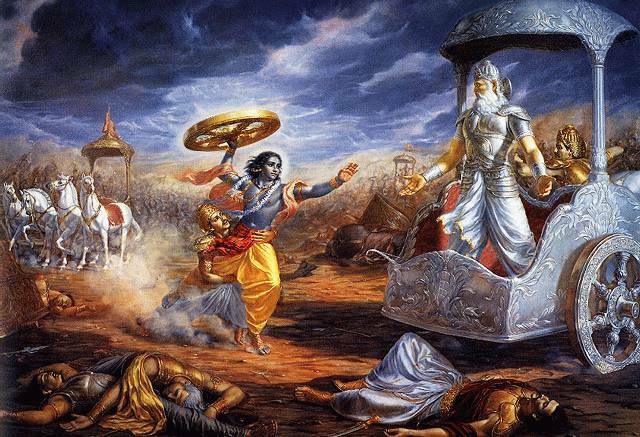 Episode 51 - Sanjay's mission clearly did not accomplish much, so this time Krishna offers to go to Hastinapur as the Pandavas' chief negotiator. When the Kauravas hear he is coming, Dhrtarastra plans on bribing him, while Duryodhana hopes to imprison him. Krishna senses all the bad vibes and decides to only stay & eat with Vidur. He also visits with the Pandavas' poor widowed mother Kunti, whom he tries to console. Surprisingly, Kunti blames her father for all her suffering. Kunti's father, Sura, was also Krishna's grandfather, and for some reason he gave her up for adoption to the chieftain Kuntibhoja. It was there, while living under Kuntibhoja's roof, that she was assigned to serve the creepy saddhu Durvasas. The result was that poor Kunti was saddled with an illegitimate baby-- young Karna. Krishna assures his aunt that the Pandavas will soon make their comeback and all will be well. Then he pays a visit to Duryodhana. Duryodhana attempts to bribe him, but Krishna refuses to even eat with them. The following day, Krishna is summoned before the court of Hastinapur, where he makes his case for a settlement with the Pandavas. The king and his councilors really don't have much to say by way of a rebuttal, so Parashurama breaks the silence by offering to tell a couple of parables. Next time, we'll hear these parables and then see how the negotiations turn out.